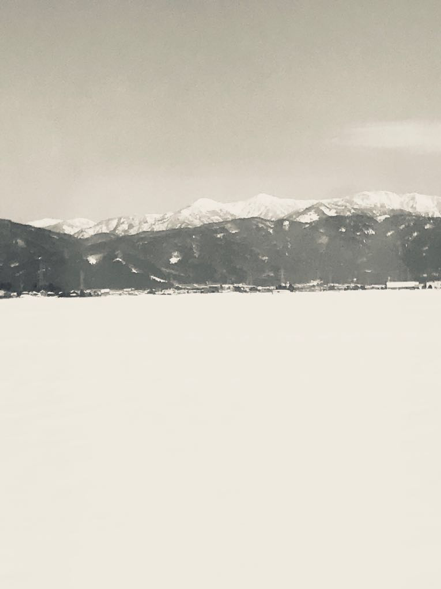 Ahead of our presentation of our new sound piece Snow at the Noh Reimagined Festival at Kings Place on Saturday 30 June, Paul Clark spoke to Ben Eschmade for the Kings Place podcast to discuss writing Snow and visiting Japan. Listen to the podcast here or read the transcription below. Buy tickets to Snow at Noh Reimagined here. Ben Eshmade: Following the highly successful 2016 edition, Kings Place welcome back Noh Reimagined on the 29th and 30th of June. The two-day festival explores the art of Noh; the iconic theatrical tradition that originated in 14th century Japan. 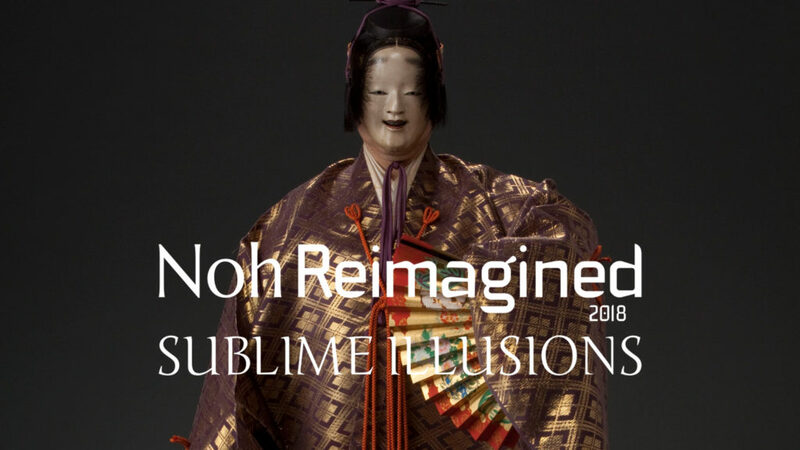 Top Noh performers from Japan will join forces innovated British artists and neuroscientists in genre-defying collaborations to examine the surreal artistic elements of Noh. Time, space and symbolism in Noh theatre will be explored in performances, workshops and talks. 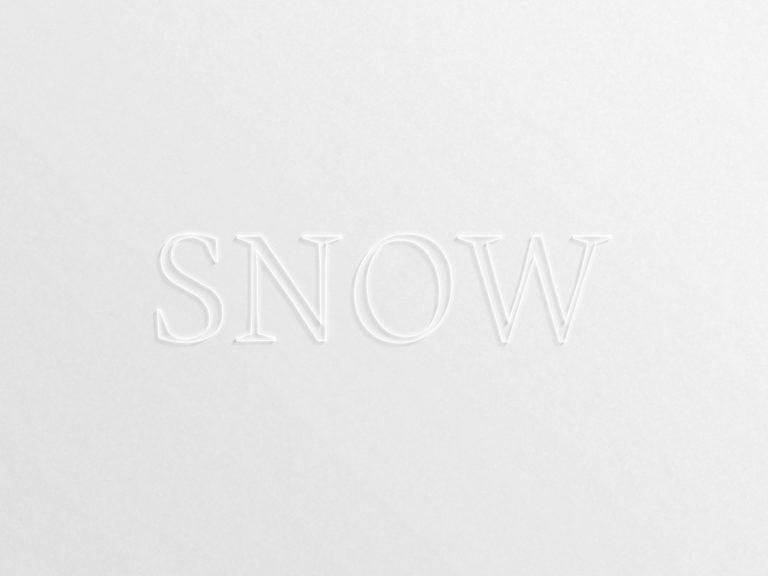 In this podcast, we speak to Paul Clark – composer and co-artistic director of CLOD ENSEMBLE – to find out more about their new work Snow, inspired as we’ll hear by Noh theatre and is part of the event, The Transformative Power of Noh. Throughout the interview, we’ll hear extracts from previous CLOD ENSEMBLE shows, as well as tradition Noh music which will give you a flavour of what to expect from this year’s Noh Reimagined festival. BE: Let’s start with what and who are CLOD ENSEMBLE? Paul Clark: CLOD ENSEMBLE is a company that myself and the other co-artistic director Suzy Willson set up. Suzy does all the visuals – all the directing, any choreography and sometimes the writing as well – and I do everything you hear – the sound and music. We’ve been going for twenty odd years now, which wasn’t our plan. I suppose our interests were the space between the genres. Our very first piece was very ambitious; it had I think 15 people on stage in a tiny studio theatre. It wasn’t really like an opera, although there was some singing. It wasn’t really like a dance piece, although the score was kind of structuring the piece in the way a dance piece does. It wasn’t really like a play, because there weren’t really many words. We’re comfortable in that place in between the genres, I would say. That’s our natural home. BE: What brought you to Noh – to this event, project, performance at Kings Place? PC: Akiko [Yanagisawa], in short. Akiko – who curates the Noh Reimagined Festival, it’s her brain child – came and talked to Suzy in the office, and inspired Suzy, I think who had always been fascinated by Japanese culture. 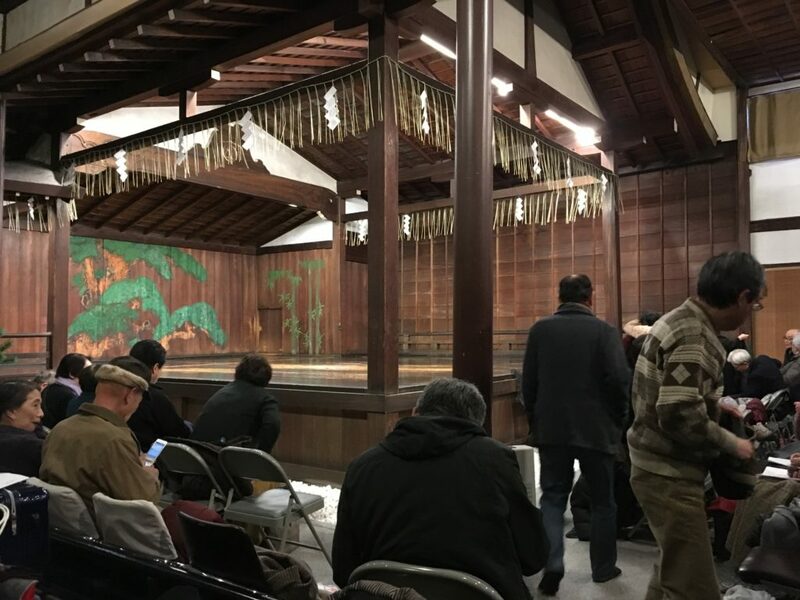 I had actually seen, not a full Noh play, but I saw a Noh presentation which I was really struck by – rather bewildered by – but had enjoyed and it was one of those things that I always meant to follow up and learn more about. Akiko gave us quite an open brief, as long as we were reimagining Noh in some way. A trip to Japan was quite important I think. Suzy was very clear – she had never seen even a Noh presentation, so she wasn’t sure how she was going to reimagine something without having imagined it first! So we got together, at short notice and with the help of the festival, we managed to get over to Tokyo, Kyoto and Kanazawa as well to experience Noh and to meet some experts in the area. We saw nine Noh plays overall and became quite addicted to the whole thing. I had done quite a lot of listening beforehand and before we saw anything we met up with Richard Emmert – an American Noh scholar and practitioner based in Tokyo who has lived there since the 70s – who briefed and debriefed us as we went to watch these plays. 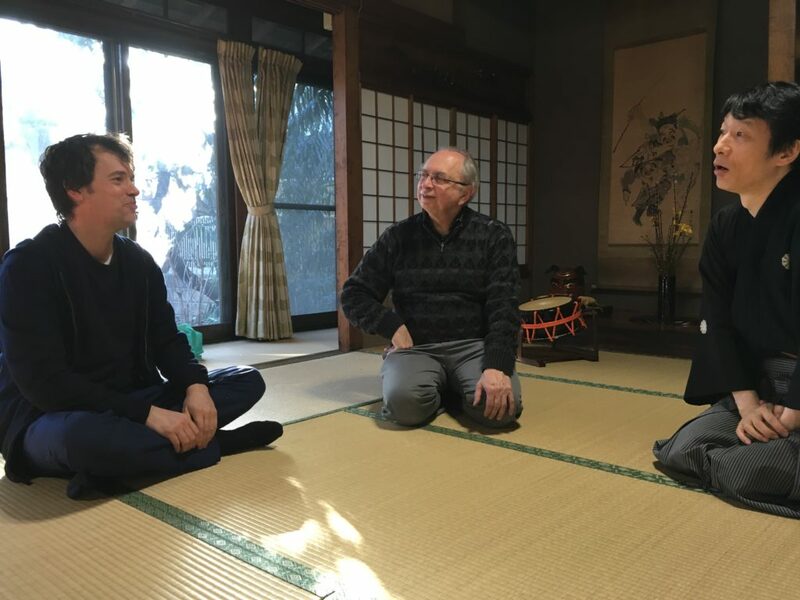 He was interested in how we were responding and very used to Westerners experiencing Noh for the first time, and taking a while to adjust to the pace of the unfolding of events. Paul Clark, Richard Emmert and Yukihiro Isso at Richard Emmert’s studio in Tokyo. BE: You talk about the pace of Noh. I presume it’s very slow? PC: You’re correct, it is very slow. You’re probably familiar with the idea of Ma, the Japanese concept of space rather than being a sense of absence, it being a positively charged; there’s potential in that space. So once you adjust to the fact that you’re not going to get a sort of Hollywood thriller kind of flow of events; although it is very compressed. A lot of Noh plays might unfold over an hour and half, people just come on and say “I’m a fisherman from so-and-so, and I’m travelling here”, and then they get on with it. So that’s all dealt with really quickly, and other things can take absolutely ages; just watching someone begin to cry can take tens of minutes. You know it’s going to happen; the audience will know the story and they might have the scripts on their laps. Once you get used to that pace, you can see the formality of it even when you’re a total beginner. It was a thrill. BE: When you were over there, it was winter and quite striking – you even showed me a picture on your phone. And I think the winter and maybe snow was the starting point of your ‘reimagining’? PC: That’s right. We were very much looking forward to seeing the famous legendary decorative gardens of Japan and the cherry blossom. Well we missed the cherry blossom but we saw one other blossom. We literally couldn’t see these ornamental gardens because they were all covered in snow. BE: I believe the New York performer Peggy Shaw is important in this and someone that you have worked with before with CLOD ENSEMBLE. PC: That’s right, yeah. Peggy famously set up the company Split Britches with Lois Weaver in the seventies in New York. Very important person on the performance scene internationally really, does quite a lot of work in Europe as well. This will be our fourth collaboration with Peggy. Suzy has kind of dreamt up the scenario for [Snow] and Peggy is co-writing the actual text, from the scenario which Suzy has begun, and will be the voice of the piece. So the audience in our Reimagining will hear Peggy playing both of these parts; the traveller and the betrayer. Although I wouldn’t want to give the impression that it’s going to be a straight-forward yarn. It’s going to be a poetic piece. For the ear more than the eye. One of the Noh theatres in Kyoto. BE: But that’s where it connects to Noh more directly. Noh is a little bit about the senses as well. The feelings and emotions. An overwhelming or an underwhelming of those things. PC: Yeah, and not having everything on show at the time. There’s often something being held back. Not using too many of the potential forces that you could be using. It’s not a maximalist form. And we’re taking a lot of the light and a lot of the visual content and sucking it out of this piece, and we’re not a hundred percent sure how much the audience will be able to see. It won’t be like most of CLOD’s work, which is highly visual. This is at much more of a meditative pace, I would say. It’s a lot more compressed than Noh that we have experienced. Rather than stretching the story out over an hour and a half, it’s only a twenty-minute piece that we are doing, so we are not respecting the pace of Noh, but we have actually kept the structure. The three-part structure [Jo-ha-kyū] that I alluded to earlier, is pretty much intact. And we’ve kept the idea of having singing, there’s this chorus that are on the stage in all the Noh plays that we saw. BE: Your role is sound and music, so I wanted to ask you a little more about that. The place I wanted to start actually is Peggy Shaw. I think it’s often not commented on when you have someone like that, who has such experience and is such a performer. The character itself is also about her voice, the timbre of her voice and the breaks in her voice. Would you agree with that? PC: Absolutely. I’m looking forward to recording her voice, which I’ll be doing in a few weeks’ time. You’ve gotta love that New York drawl. She’s got a really particular delivery – she’s not a trained actor and she writes all her own words so she always writes for her own voice. Although Suzy has created the scenario, Peggy will be writing in her own rhythm and has a particular pace which is a very musical thing. That’s absolutely the heart of it. 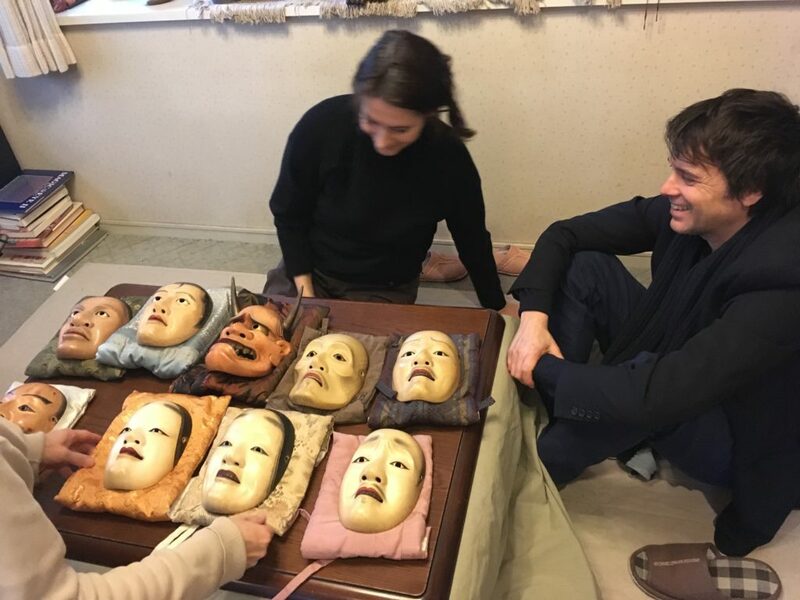 Suzy Willson and Paul Clark with Richard Emmert’s selection of Noh masks in Tokyo. BE: I think I’m allowed to say that you’re going to have a guest flute player – could you talk about him? PC: We’re going to – almost certainly – work with [Yukihiro] Isso who is leading a few projects as part of the festival. He’s a virtuoso player but not only on the Noh flute, which is a very particular sound but he can also play many other flutes. We were really lucky to spend a day with him and some of his musical colleagues, where we were able to find a way through some of the musical head-scratching. 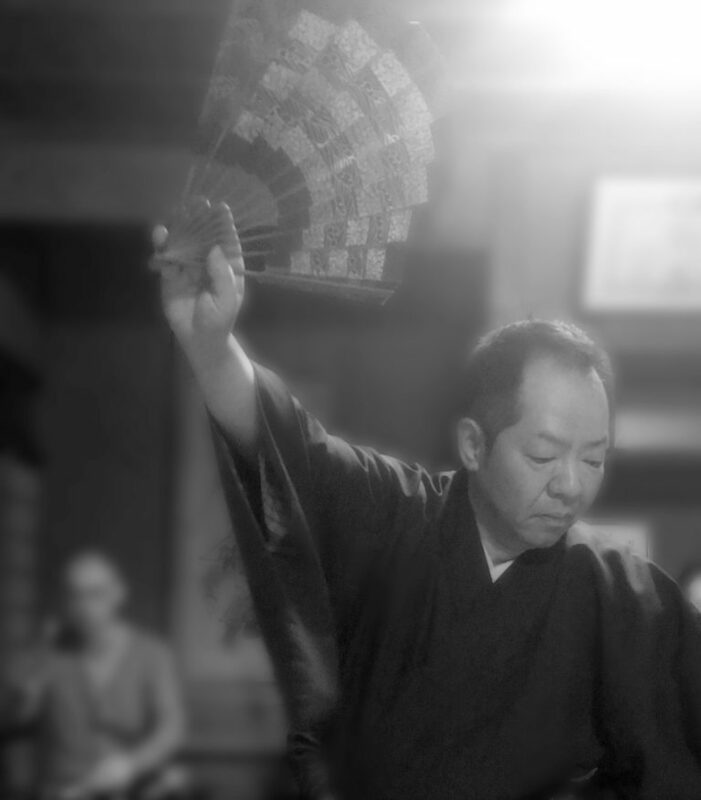 As a western musical when you encounter Noh music, there’s a lot of counter-intuitive things going on in terms of the pitch, how improvised or not it is, how the rhythm works. There’s lots of challenging concepts and he was able to, with his colleagues and Richard Emmert who was there as well, give me a way, way better insight in to how things worked in reality, and how the musicians were thinking. I don’t want to give too much away, but he will have a part in the performance. I mean, he’s worth coming to the festival just to see him to be honest, he’s really phenomenal. BE: What would you say to someone who hasn’t experienced Noh before? I mean, there’s obviously more traditional and more reimagining at the festival. It sounds like it’s a rare opportunity to see something which I’m told is 650 years old. PC: I think the influence of Japanese culture more broadly – the way we think about space, especially about architecture and design – seems to be so sort of in the air. Obviously filtered through our own western eyes and ears. I think it’s probably never been easier for a Westerner to sort of ‘get it’, because we’re open to those concepts philosophically. I would say don’t be frightened, just turn up. It’s an amazing thing.